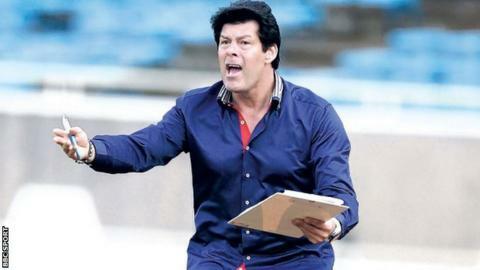 The Rwanda FA (Ferwafa) have banned Rayon Sports FC's head coach, Luc Eymael, for two years following his part in the violent scenes which followed last weekend's league game against AS Kigali. Eymael and his technical bench were left incensed at the final whistle after Rayon Sports were held to a 1-1 draw at the Amahoro Stadium. A win would have kept them top of the table. They complained that the referee had added too little stoppage time with violence breaking out after the match. Eymael's suspension will now rule him out of contention to be Rwanda's national coach as he had been short listed among seven other coaches on Thursday. The Belgian has also been asked to pay a fine of US $750. Rayon Sports player Cedric Amissi has also been banned. The club's top striker has been suspended for six months. The Rwanda defending League champions Rayon Sports will also have to play their last league match against Musanze FC behind closed doors. The punishments, announced by the FA's Vice President Veduste Kayiranga, are the most serious ever in the Council for African Football Associations (Cecafa) region. Kayiranga also said Rayon Sports will also have to pay for the damage to Amahoro Stadium and also for damaging the vehicle of second assistant referee Ambroise Hakizimana. "The Club Secretary General Olivier Gakwaya, who is reported to have mobilised fans and encouraged them in the chaos has been banned from stadiums for two years and handed a cash fine," added the FA official. Kayiranga told BBC Sport that the suspended officials will have until 27 April to appeal against the decisions.